Räksallad, skagenröra... this Swedish creamy shrimp salad has as many names as it has uses. 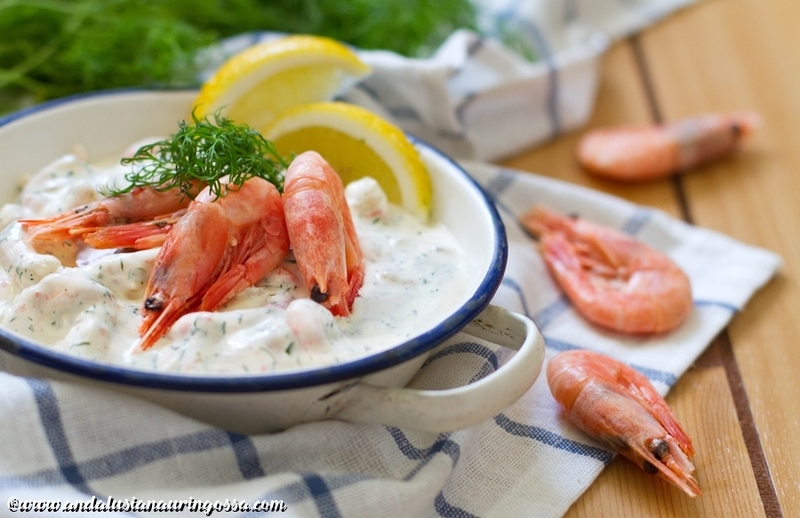 It would be impossible to even try and imagine Swedish cuisine without räksallad, shrimp and mayo salad. 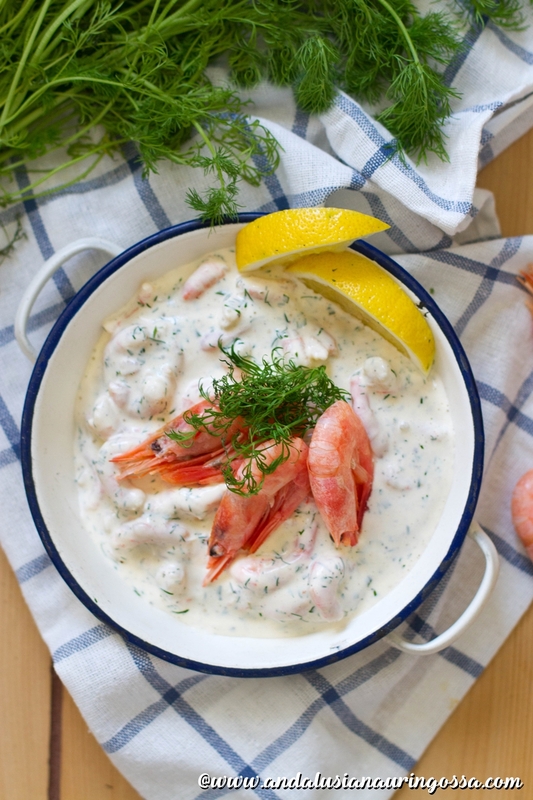 Also called Skagenröra or West Coast salad (Västkustsallad), these creamy shrimp salads are more like spreads or dressings and are loved by Swedish, no matter what the occasion. They make an appearance in the Midsummer's celebrations, Christmas buffets, at brunches and, well, everything and anything in between. While West Coast Salad usually contains other ingredients (mussles, fish and yes, occasionally even them veg...) , too, Skagenröra is an unapologetic ode to the good life and archipelago's endless summer days and featurs nothing but shrimp and some mayo. For Asian twist you could substitute some of crème fraîche with sweet chili sauce and use coriander instead of dill. Another way to jazz things up a bit would be to add some vendace roe (in which case do not add any salt) or a sprinkling of chilli powder. You could also substitute chives with half of a finely minced small red onion or by switching Dijon mustard to horseradish. Fresh dill on the other hand is something you need to have. Lots of. There's something about its scent alone that immediately transports one to summery days and al fresco lunches with all your friends (all disgustingly tall, willowy and blonde, of course...) around the table. It's also insanely versatile: spoon some of it on halved hard-boiled eggs for easy starter, use it to top slices of malty archipelago bread, serve it as a dressing for fish or have it with jacket potatos. Skagenröra is also an essential condiment in the fast food kiosks (I'll be introducing you guys to my absolute Swedish street food favourite on the next blog post!) and people shovel this on their hot dogs, burgers and grilled sausages and fries. The easiest way out is, of course, using frozen, peeled shrimp, but trust me - you don't need to be a fussy Gothenburger to tell the difference between those and the whole ones you've peeled yourself. 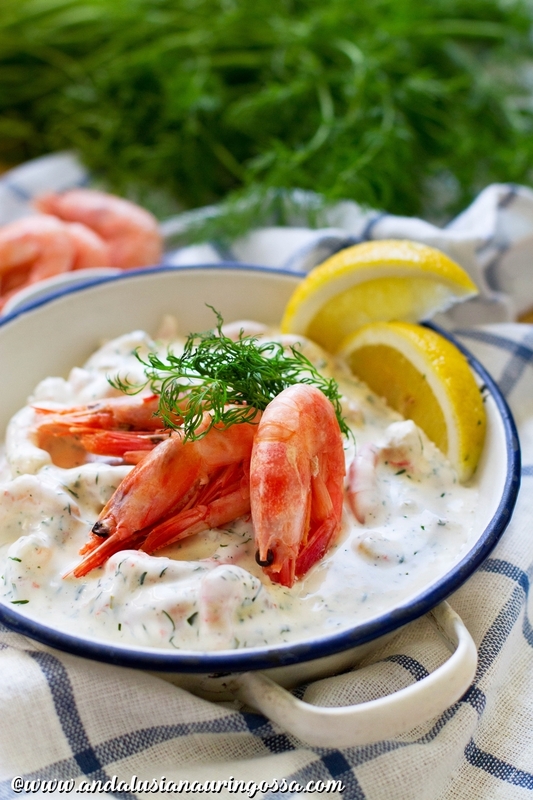 For 200 grams of peeled shrimp you need (depending on their size) a little more than half a kilo of the whole ones. Peel the shrimp (if using whole ones) or thaw and drain the frozen ones. Pat dry and, if they're very big, chop roughly. Combine remaining ingredients, check the taste and season as needed. Fold in the shrimp and let chill for a couple of hours before serving. Räksallad, skagenröra, how ever you want to call it - what's your favourite use for this Scandinavian delicacy?